This variety is harvested from mid-November to Mid-March; its peridium (outer layer) is composed of small wart-like bumps in a polygon form, and it is a dark brown, and black at maturity. The truffle is normally round, and slightly bumpy. The flesh is noir/violet at maturity, with fine veins that are well marked and divided. White when cut open, the flesh turns red on contact with air. To the nose the perfume is of a dry mushroom, humus, and wet forests. In the mouth the truffle is crunchy and soft simultaneously; at first spicy with a slight taste of black radish, then a hint of hazelnut, with a finish of wooded forest floor, sometimes earth when tasting the skin. This truffle is harvested between November and March. The outer skin, dark brown with black patches is fragile, and comes off easily. In a rounded bumpy form, the flesh is grayish black, translucid with large white veins that are widely spaced. To the nose, the perfume is sometimes agreeable, but often strong and musky. On the palate there is a slight bitterness and taste of humus soil. Black with flesh at maturity that is dark brown; there are numerous white veins. To the nose a smell of mushroom, and on the palate the taste is variable; well mature the bitter taste is replaced with a pleasant hazelnut taste. Truffle of Saint Jean, summer white Truffle. 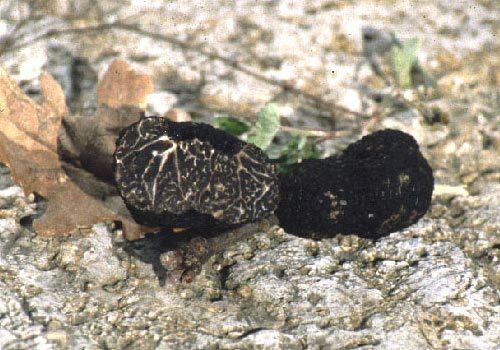 This is the most common truffle but little sought out; it is harvest from May to September. 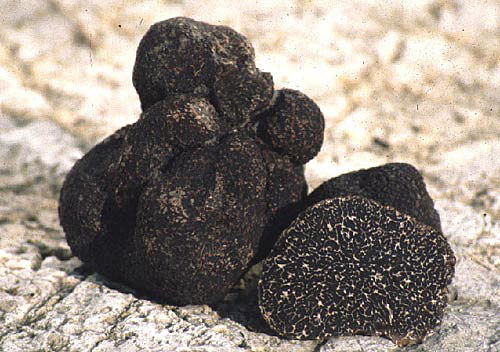 The truffle is generally large in either a rounded or bumpy shape. The skin is blackish/brown. The flesh becomes beige at maturity and it has numerous white veins. This truffle is either round or irregular in shape, with a very dark outer skin, with wart-like bumps of 3-5 mm in size on the top. This truffle always has a small channel on the bottom. Normally small in size, but it can reach the size of an egg, with grey, then dark chocolate brown flesh at maturity. It possesses white veins that form a labyrinth pattern. Always agreeable to the nose, often strong in odor, with an after thought of phenol or tar, which disappears shortly after harvesting. 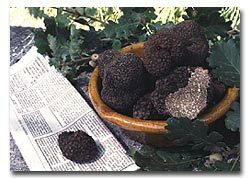 Although bitter in taste, this truffle is well married with certain dishes. Harvesting takes place from September to January, and its production zone is the same as that of the melanosporum and the brumale. These five varieties of truffles all have different tasting and cooking qualities, which then translate into different prices. If one takes a quality scale of 100 for the Tuber melanosporum, then the Tuber mesenterique would be in 15, 20 for the Tuber aestivum, 50 for the tuber uncinatum and 60 for the tuber brumale. After choosing a site for your truffle plantation you should have the soil tested to measure its natural pH, buffering capacity, organic matter content and the availability of plant nutrients. The suitable soil pH range is between 7.5 and 8.3, but 7.9 is considered ideal. If your soil pH is below this level you will need to add lime to raise the pH. Raising the pH can take several years with annual lime applications, but the trees can be planted before the pH reaches the ideal level. However, if the soil pH is low then other fungi living naturally in that soil are probably better adapted to low pH conditions and the faster you get your pH into the ideal range the less likely other fungi are to become established on the roots of your truffle trees. The best approach would be to raise the pH all the way to 7.9 before the trees are planted to give potential competitors as little opportunity as possible to exploit non-ideal conditions, but few farmers are willing to wait that long before planting. The amount of lime required to raise the pH varies with the starting pH, the soil texture and buffering capacity and the type of lime that you use. The ideal pH is way above levels ideal for maximizing soil fertility and approaches the level where most plants begin to suffer from various nutrient deficiencies. Consequently, agricultural specialists will have a difficult time predicting the amount of lime required to raise the pH since they typically have no experience with raising pH to these levels. The task for the truffle farmer is to add lime incrementally with continued pH testing until the ideal pH is reached. Lime can take as much as a year to change the pH and it is often difficult to add enough lime in a single application so the process of applying lime is necessarily gradual. Once the ideal pH is reached it will need to be maintained with supplemental lime applications as necessary since rain water tends to leach calcium from the soil and reduce pH over time. It is also important to correct serious nutrient deficiencies and imbalances prior to planting. 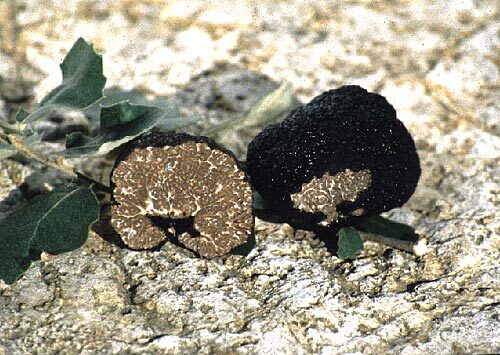 Truffles often do better in relatively low productivity soils, but they use all of the same nutrients required by their host trees and will suffer if those nutrients are seriously deficient or made unavailable by imbalances. However, it is important not to overdo it with fertilizers. Generous fertilization will benefit the host tree, but at some point the truffles are unable to take advantage of excess nutrition and other fungi that are able to respond to higher soil fertility may gain the competitive advantage. Arrangement and spacing of the trees is a subject of some debate and different approaches are used. 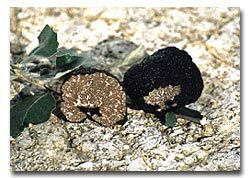 Generally speaking, Tuber melanosporum grows beneath relatively isolated trees or trees at the edge of forests in its natural habitat. Thus, many plantations in Europe are fairly sparse with as few as 100 or fewer large trees per acre. In other cases the trees are packed close with as many as 1000 trees per acre to encourage the movement of the fungus from one tree to the next through vegetative growth of the fungal mycelium. The spacing of the trees also depends to a large extent on the size of the tree species used, soil fertility, and the willingness of the farmer to thin the trees when they begin to crowd, possibly removing some that may be producing truffles. 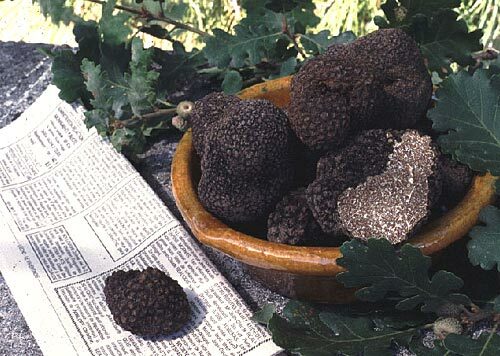 It is not necessarily true that more trees will produce more truffles. 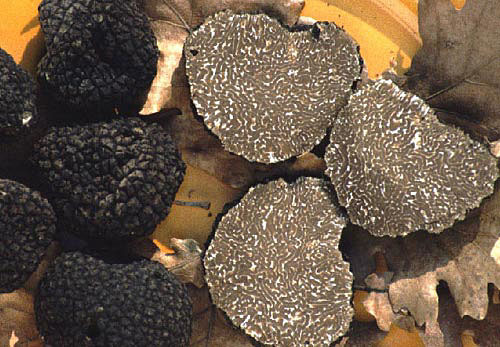 Trees stressed by overcrowding may have fewer resources to give to the truffles and closure of the canopy is generally considered harmful to survival of French black truffles. Further, while root contact between trees will facilitate spread of truffle mycelium, it also facilitates vegetative spread of competing fungus species. Plantations established with high densities are fine when the trees are young and small, and by having more trees the likelihood of early production increases, but they must be thinned later to prevent crowding. One plantation arrangement promoted in New Zealand is to mix large and small trees to take advantage of early production beneath the small trees and longer production beneath the large trees. In this approach, the trees are planted at high densities with, for example, two hazelnut trees per oak tree. The hazelnuts should begin production several years earlier than the oaks, but their production will decline after 20-30 years. The oaks take longer to begin production, but they can maintain it for up to 50 years. The plantation density is calculated so that the oaks will be at a desirable spacing once they begin production and the hazelnuts are removed. The site should be plowed prior to planting to remove existing vegetation and set the stage for planting and maintenance of the plantation. Any lime and/or fertilizer applications are easiest at this time before the trees are planted. This is also the easiest time to install buried irrigation lines. New World Truffieres ships it trees in the winter while they are dormant and they should be planted well before bud burst in the spring. Planting holes can be dug by hand or with a mechanical augur to a depth of approximately 10 inches and a width of at least 4 inches. When filling the hole to bury the roots of the truffle tree the soil should be broken up to eliminate clods so that no voids are left around the tree’s roots. The roots should be buried to just above the root crown. Healing the trees in by drenching the soil in the planting hole with water will collapse any remaining void spaces making better contact between roots and soil and it will improve growth and survival through the first year. Where rabbits and deer are common the seedlings should be protected from browsing until they grow large enough to endure it. Once the trees are planted it is very important to control weeds and grass growing near them. Grass will kill your trees by depriving them of water and nutrients. At this stage mowing is not sufficient within a few feet of the trees and light tilling or hoeing is more effective to prevent weed establishment. Complete weed and grass control in the vicinity of the trees is essential until they are well established. Finally, irrigation through the first year or two is helpful to ensure survival. 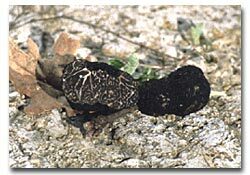 Once your plantation is established and the trees have reached 3-5 years old brules or burnt areas where the grass is killed by the truffles should begin to appear. At this point various plantation management strategies can be employed. 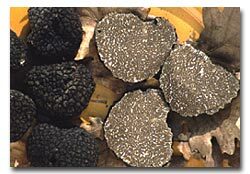 The basic management goal is to maintain soil moisture and temperature conditions beneficial to truffle production. The approaches necessary to maintain these conditions can vary from place to place and different farmers may want to use different methods depending on availability of equipment, time and money. The basic management practices include irrigation, weed control, soil aeration, pruning, thinning, mulching, and in some cases fertilization. 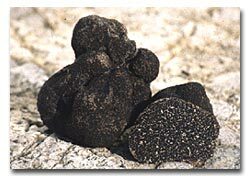 A fundamental requirement in all cases is to maintain the soil pH necessary for truffle production. At the extremes of low and high intensity management are the Tanguy and Pallier methods. At the low intensity end of the scale the Tanguy method calls for mowing to control weeds, but does not involve soil aeration pruning, irrigation, or fertilization. This method is simple enough for those without tractors, availability of irrigation water or the time and money to invest in more intensive management approaches. It is also safer in the sense that it errs on the side of less intervention with its potential to damage the plantation. However, it generally takes a couple more years for truffle production to begin. The more intensive Pallier method calls for light tilling or harrowing in the spring and early summer to control weeds and aerate the soil. The trees are pruned into a cone with the point facing down to maximize penetration of sunlight through the canopy and warm the soil. And finally, irrigation is supplied as necessary to emulate the summer and fall weather that produces the largest truffle yields. It is possible through this method to till too deeply and damage roots, and to irrigate too much, giving the competitive advantage to other fungi so these methods should be used carefully. However, the Pallier approach is thought to produce truffles somewhat earlier than less intensive approaches and to allow the farmer more control over microclimatic conditions. In some cases irrigation may be necessary simply to keep the trees and the truffles alive if natural precipitation is insufficient.